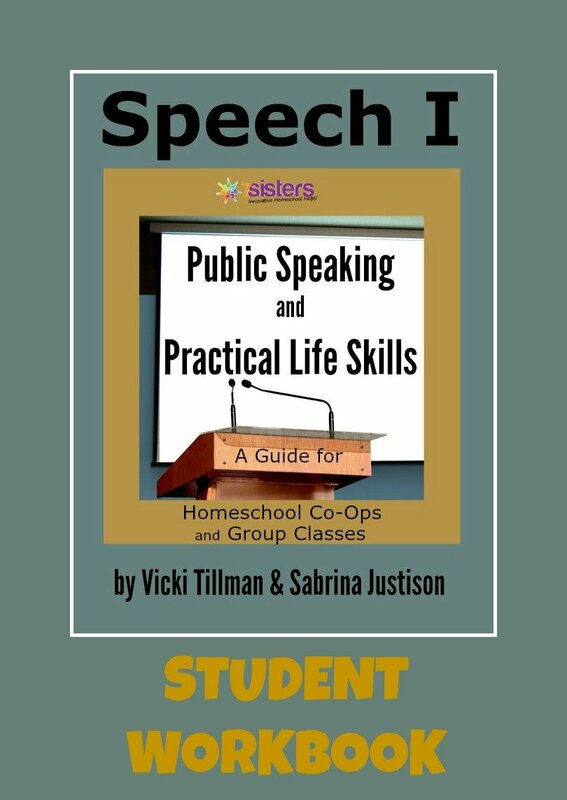 Here is how to teach Speech in homeschool high school co-op. Want to give your teens some powerful (and fun) life-prep experiences? Give them a co-op Speech class! I know many teens live in mortal fear of public speaking. Often they’re afraid of public speaking because they haven’t had any fun, meaningful training. Most of the time Speech classes are stuffy and serious; of course a stuffy, serious class is enough to turn teens into nervous-nellies. GOOD NEWS! I can tell you from years of experience leading our local homeschool Rhetoric League that when Speech is presented in safe, amusing experiences, teens find out that they CAN do public speaking- and it’s not that bad! That’s why 7Sister Sabrina and I brought together the curriculum and activities that we’ve used in my Rhetoric League and her Drama Camp and Drama Classes. 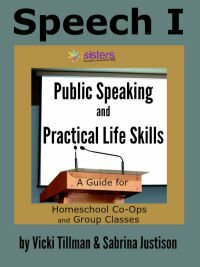 We’ve compiled it into a user-friendly Speech I curriculum for homeschool co-ops and group classes. The curriculum consists of a teacher’s guide with all the lesson plans, links to videos, and instructions for the co-op Speech class leader PLUS there is an inexpensive Student Workbook that each student will use (instead of purchasing the more expensive teacher’s guide). Decide if you want your co-op Speech class to be 15 weeks or 30 weeks long. If your co-op is following a 15 week schedule, you will follow the directions for that schedule. If your co-op would like to spend 2 weeks on each topic for a total of 30 weeks, follow the instructions for additional fun activities for each topic. The lesson plans are built right into the basic text (for teachers or students working individually). My grown kids tell me that Speech was the most important group activity we did in high school. Download your Teacher’s Guide (with evaluation form on separate pdf) and your student texts today. Your co-op teens will thank you.